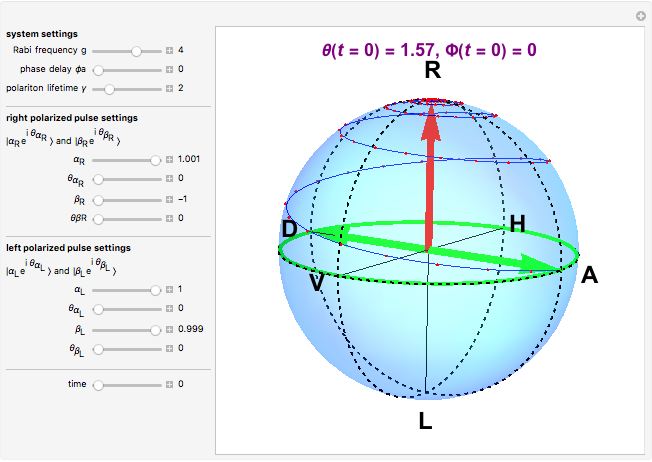 The state of polarization of light can be represented on the so-called Poincaré sphere, which provides a graphic representation of the Stokes parameters . The circular-right polarization R corresponds to the north pole of the sphere and the circular-left polarization L to the south pole. The other cardinal points define the diagonal D, antidiagonal A, horizontal H, and vertical V polarizations. 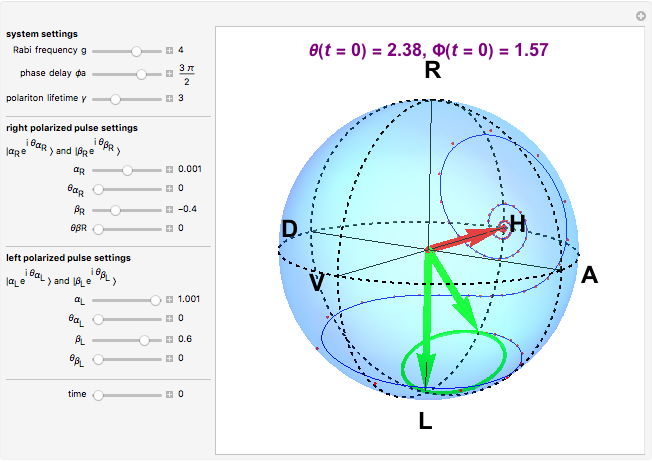 The Poincaré sphere can be used to track the state of polarization in a variety of contexts, such as spatial variations . This Demonstration lets you tune these parameters as well as the system parameters (Rabi frequency , polariton lifetime ) and track the state of polarization in time. 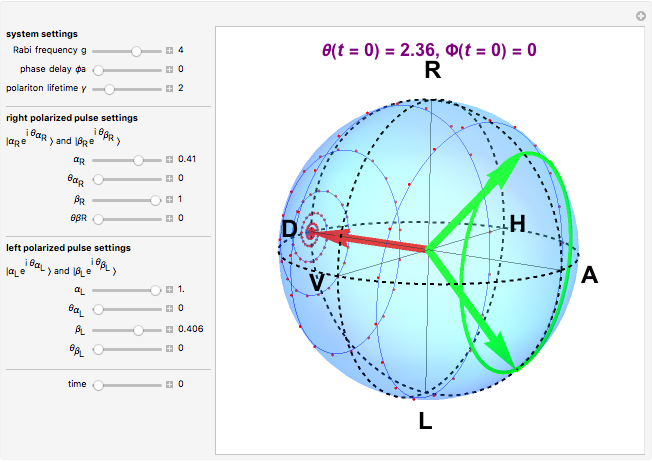 Without decay ( ), the polarization describes a green circle, whereas with decay ( ), the polarization drifts around the sphere to converge to an asymptotic value, pointed to by the red arrow; the blue line shows the polarization trajectory between these two points, which can be tracked in time with the purple arrow. D. Colas, L. Dominici, S. Donati, A. A. Pervishko, T. C. H. Liew, I. A. Shelykh, D. Ballarini, M. de Giorgi, A. Bramati, G. Gigli, E. del Valle, F. P. Laussy, A. V. Kavokin, and D. Sanvitto, "Spanning the Full Poincaré Sphere with Polariton Rabi Oscillations." arxiv.org/abs/1412.4758. L. Dominici, D. Colas, S. Donati, J.&ThinSpace; P. Restrepo Cuartas, M. De Giorgi, D. Ballarini, G. Guirales, J.&ThinSpace;C. López Carreño, A. Bramati, G. Gigli, E. del Valle, F.&ThinSpace; P. Laussy, and D. Sanvitto, "Ultrafast Control and Rabi Oscillations of Polaritons," Physical Review Letters, 113, 2014 p. 226401. journals.aps.org/prl/abstract/10.1103/PhysRevLett.113.226401. David Colas, Elena del Valle, and Fabrice P. Laussy "Polarized Polariton Fields on the Poincaré Sphere"